Possible CME/EMP Damage And Close Encounters Of The Asteroid Type!?? February 16, 2014 12:55 AM EST — (TRN) — The GOES satellite in orbit between the Sun and Earth, has detected a MASSIVE electro-magnetic shockwave headed directly toward earth from a coronal mass ejection from the Sun. This event could crash electrical power grids all over earth within hours. The size of this event is so enormous is spiked off-the-chart as shown in the GOES satellite report below. UPDATE 8:25 AM EST — Dozens of electrical poles in Melbourne Australia burst into flames overnight, leaving tens of thousands without electricity. 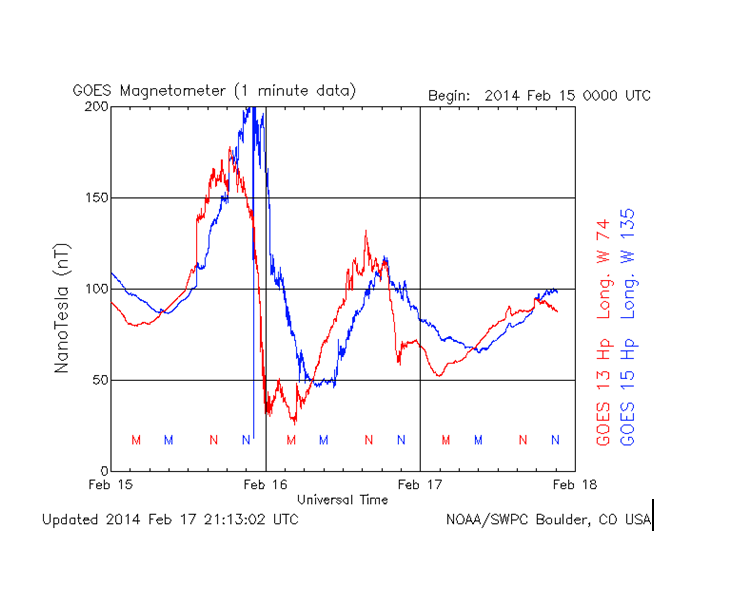 As the chart at left shows, the GOES satellite was struck by the electromagnetic shock-wave from the sun at about 10:00 PM on Saturday, Feb. 15. The shock-wave was so utterly enormous that it actually blew the measuring meter OFF-THE CHART. It will arrive at earth within a matter of hours. This could cause widespread damage to anything electrical: the power grid, homes, cars, phones . . . . everything. Readers are urged to make immediate preparations to survive for days without electricity. 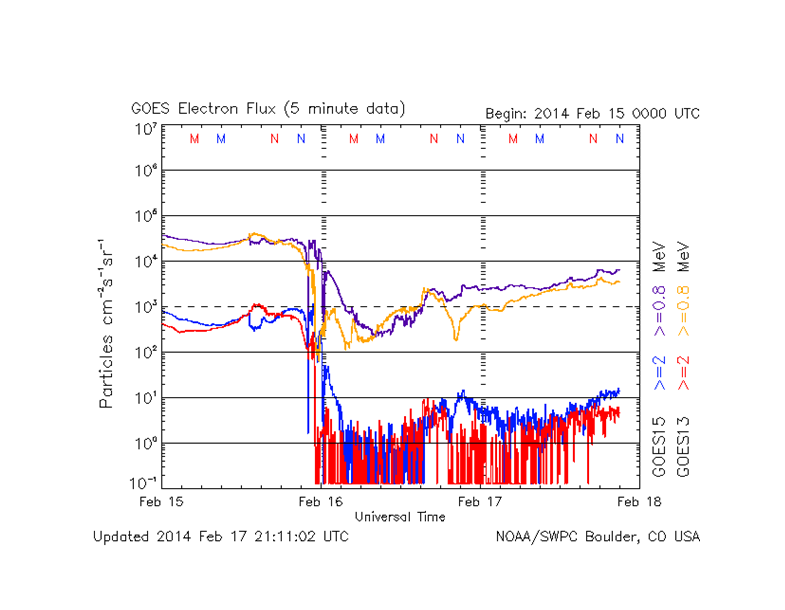 The second readout from the GOES satellite shows Electron Flux. It proves that at about 10:00 – 10:30 PM EST, an enormous burst of electrical activity is following the magnetic shock-wave and the amount of electrical energy is so intense, it went OFF THE CHART as the satellite was trying to read it. The amount of energy coming at earth is staggering and will likely do direct damage to most anything electrical. Readers are advised to make immediate preparations for being without electricity for an extended period. You may also wish to unplug any items that you are not using, to try to minimize any power surges that may come before an outage occurs. “Asteroid 2000 EM26, estimated to be about the size of three football fields, will closely approach the Earth on Monday evening. An asteroid estimated to be the size of three football fields is set for its close-up on a live webcast as it whizzes by Earth on Monday, roughly a year after one exploded over Russia and injured 1,200 people. Slooh Space Camera plans to track the close approach of Asteroid 2000 EM26 as it races past the planet at approximately 27,000 miles per hour, starting at 9 p.m. EST, the robotic telescope service said in a statement on Slooh.com. The 295-yard asteroid was expected to streak by Earth little more than a year after another asteroid exploded on Feb. 15, 2013, over Chelyabinsk, Russia, injuring 1,200 people following a massive shockwave that shattered windows and damaged buildings. Chelyabinsk region officials had wanted to mark the anniversary by giving a piece of the meteorite to each 2014 Winter Olympic athlete who won a medal on Saturday at the Sochi Games. However, the International Olympic Committee at the last minute said it could be done only after the games and separately. Viewers watching Monday’s live webcast on Slooh.com can ask questions of Slooh host and astronomer Bob Berman on social media by using the hashtag #asteroid, the statement said. The webcast will use images of Asteroid 2000 EM26 captured from Slooh’s ground-based telescopes. Its flagship observatory is located on Mount Teide in the Canary Islands, in partnership with the Institute of Astrophysics of the Canary Islands, the statement said. 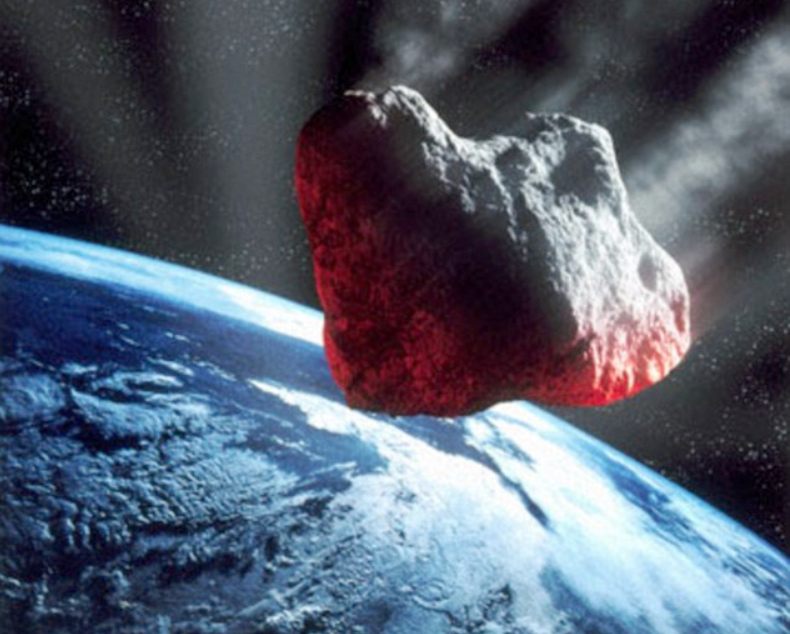 “We continue to discover these potentially hazardous asteroids — sometimes only days before they make their close approaches to Earth,” Paul Coz, Slooh’s technical and research director, said in the statement. “We need to find them before they find us!” Coz said in the statement. 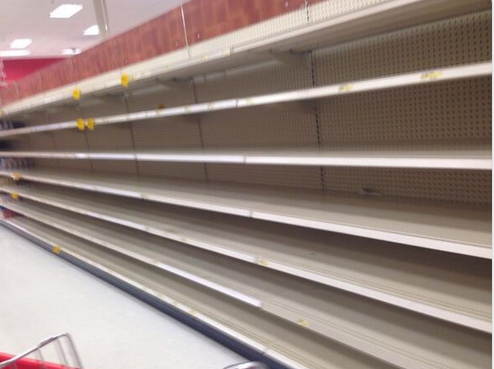 Anyhow, just thought you should know – THAT WAS A JUST STORM EVENT – WHAT WILL IT BE LIKE WHEN A MAJOR EVENT OCCURS? It’s interesting to ponder if the scientists at these biotech corporations have already identified this method? In one of the blood samples the relative concentration of plant DNA is higher than the human DNA. The study was based on the analysis of over 1000 human samples from four independent studies. PLOS is an open access, well respected peer-reviewed scientific journal that covers primary research from disciplines within science and medicine. It’s great to see this study published in it, confirming what many have been suspecting for years. When it comes to genetically modified crops and foods, we really have no idea of what the long term effects will be on the public. The very first commercial sale of genetically modified foods was only twenty years ago in the year 1994. There is no possible way that our health authorities can test all possible combinations on a large enough population, over a long enough period of time to be able to say with certainty that they are harmless. Geneticist David Suzuki recently expressed his concern, saying that human beings are part of a “massive genetic experiment” over many years, as thousands of people continue to consume GMO’s, and it makes sense. Advances in genome science over the past few years have revealed that organisms can share their genes. Prior to this, it had been thought that genes were shared only between individual members of a species through reproduction. Geneticists usually followed the inheritance of genes in what they would call a ‘vertical’ fashion, such as breeding a male and female -you follow their offspring and continue down the road from there. Today, scientists recognize that genes are shared not only among the individual members of a species, but also among members of different species. It’s not like a human being mates with an apple, banana or a carrot plant and exchanges genes. What biotechnology and biotech corporations like Monsanto have done, is they have allowed for the transfer of genes from one to the other without any regard for the biological limitations, or constraints. The problem with this is that it is based on very bad science. The conditions and biological ‘rules’ that apply to vertical gene transfer, at least those that we are aware of, do not necessarily apply to horizontal gene transfer. Biotech science today is based on the assumption that the principles governing the inheritance of genes are the same when we move genes horizontally as they are when they are moved vertically. It just goes to show that GMO’s should be subjected to much more experimentation and rigorous research before we continue to consume them. How can our governing health authorities approve these as safe? It’s almost as if they told us they were safe, and we just believed them without questioning it. We seem to be a very gullible race, but things are changing and more are starting to question the world around them. I personally believe the intentions go beyond money, but that’s another story. Genetically modified crops have infiltrated animal feed since 1996, and it’s normal for them to have a complete GM diet. Studies have linked GMO animal feed to severe stomach inflammation and enlarged uteri in pigs. It’s also important to note that gene transfer among genetically engineered agricultural crops and surrounding native species has given rise to a highly resistant species called super weeds. According to the world health organization, gene transfer and the movement of genes from GM plants into conventional crops or related species may have an effect on food safety and food security. Prior to this year, governments concluded that transfer of DNA from GM crops/foods is unlikely to occur. Now we can see that they are wrong, or perhaps they had knowledge of this already? Regardless of the fact that DNA from GM foods can be transferred to humans and animals, very little is still known today and what is known does not look good. There are studies linking GMO’s and pesticides to various ailments. We’ve presented and written about them on our website numerous times, this is another article to add to the growing amount of evidence to suggest we need to halt the production of GMO’s until we conclusively know that they are safe for human consumption. It’s not a mystery why most countries around the world have completely banned GMO’s.